Grains seeing some strength in overnight trading. Wheat up 6 cents, corn up a penny, and beans up 4 cents. The feud between China and the United States sparked by the arrest of a senior Huawei telecoms executive in Vancouver appears poised to inflict collateral damage on Canada, which has sought to build closer ties with Beijing amid an increasingly unpredictable trade relationship with the US. Weekly US soybean export sales are est near 600-900 mt vs 629 last week, corn 800-1,100 mt vs 1,266 last week and wheat 175-400 mt vs 377 last week. The U.S. Midwest weather forecast will remain cold into the weekend with a warming trend expected next week and into the second half of December. Above normal temperatures and above normal precipitation is expected from December 12th-20th for most of the Midwest. 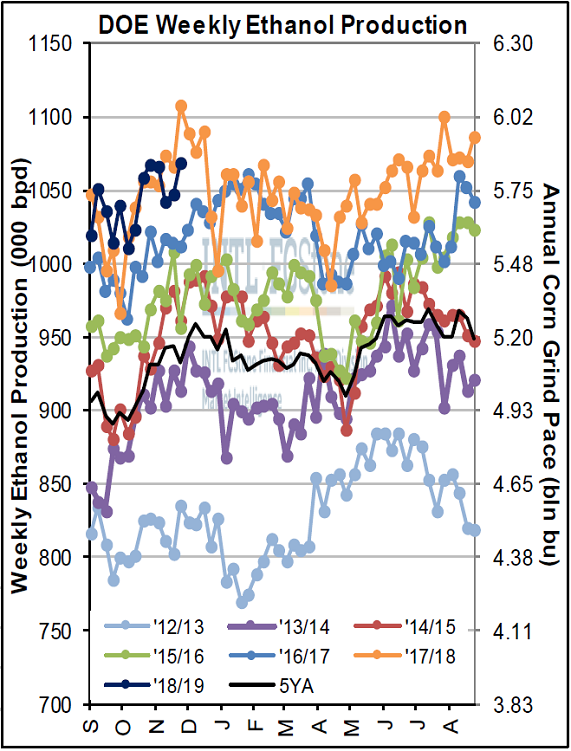 Weekly total fuel ethanol production increased for the sec-ond straight week, to 1.069 million barrels per day on the week ending November 30th; that was up 21k bpd on the week but still behind the record total of 1.108 mln bpd on the comparable week last year. Cumulative production since Sept 1 did rise to 1.042 mln bpd, still a couple million ahead of last year’s pace, though that cumulative pace last year did rise to a peak at 1.049 mln bpd three weeks from now (matching that number again by the end of August).